The fiery ascent of Space Shuttle Endeavour marks the last scheduled night launch of the Space Shuttle Program and the fifth to last mission (STS-130) before the end of the Space Shuttle Program. Endeavour and its six astronauts left Earth on a construction mission to the International Space Station at 4:14 a.m. on 8 February 2010 from Kennedy Space Center. A launch attempt the day before had been scrubbed due to thick clouds over KSC. 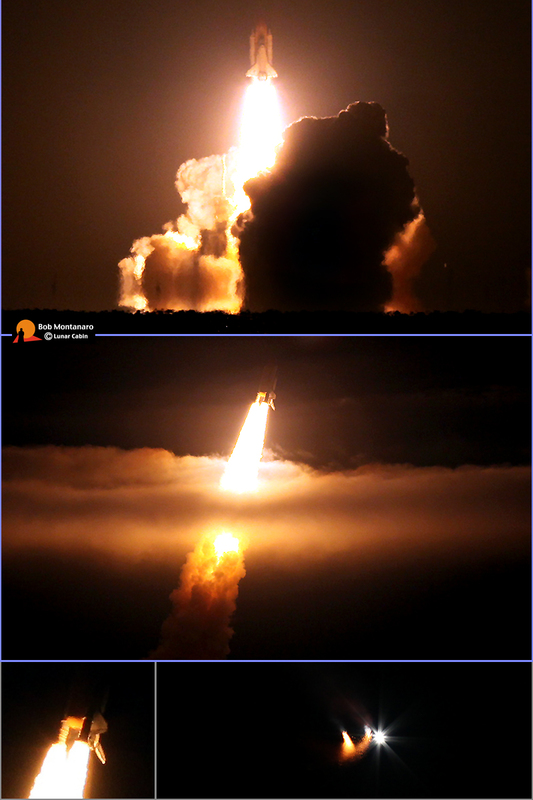 The images show from top, Endeavour clears the tower, then burns through the low, thin cloud deck while, at bottom left, a close-up of the Solid Rocket Boosters illuminating the bottom of the External Tank and rear of the Shuttle and, bottom right, separation of the Boosters a little over two minutes into the flight.